Mechtech technology allows Optimus Prime to achieve the ultimate in both speed and power while in vehicle battle mode. This amazing prowess on the battlefield earns this edition the special title "Striker". His primary armament, the Mega Striker, is the combination of the Eliminator Gun and Assault Blaster and fires electromagnetically accelerated bullets. Even his Battle Shield converts its shape, for use in both defense and offense during close combat. Prelude: For a long time the Leader-class Optimus Prime of the ROTF / HftD line, especially the two Buster incarnations, were regarded as the best toy of the entire Movieverse line-up. Only minimal flaws, superbly resembling his screen incarnation. When Dark of the Moon came into theaters, though, the disappointment hit hard. Firstly because Optimus Prime’s look was changed quite a bit, meaning the Leader figure was no longer quite that accurate, and second because, for the first time ever, a Movie toy line would not feature a Leader-class Optimus Prime. Only Takara did the right thing and reengineered the existing Leader figure, resulting in the Jetwing variant, complete with flight tech. And now we have the second incarnation right here, the Stealth Force version Michael Bay cut from the movie. Alternate Mode: Optimus Prime still transforms into a tuned Peterbuild 379 and the details and realism are as strong as ever. You can see individual rivets on the chassis, the rims look realistic and even the semitrailer is done well once again. That’s not a given. Details of the Striker version: the paint job is pretty much identical to that of the Buster version, the only significant difference being the missing flame paneling. That would have perfected this vehicle mode. The plastic is somewhat darker than in previous incarnations. Unfortunately the darker (and better-looking) grey was mixed with lighter grey. Why? Maybe to save money, I don’t know. Stealth Force / Brute Mode: Only a small list of characters was given this mode so far: Leadfoot, Sideswipe, Topspin, Roadbuster, and Bumblebee. Okay, strictly speaking the very first Transformer we saw in this mode was Ironhide in the final battle of the first movie. Optimus Prime’s appearance in this mode, however, was lost on the cutting room floor. Only the DOTM computer game showed a similar, if somewhat overdone variant. No comparison to the brutal appearance of this toy. Just looking at it, the Stealth Force mode looks fantastic and was, for me, the main reason for buying this toy. Added parts on the hood create the illusion of having it partially transformed. There are two variants you can do here: You can put it flat on the original hood or put it up at a slight angle – I like both versions. The sleeper cabin is also partially transformed, thanks to slightly redesigned fuel tanks. Which is the main reason why this variant of Optimus Prime is missing the Buster tanks / cannons. Changing the tanks is what makes it possible to clip on the partially-transformed cabin. Once again you have two possible variations: Up front as with the original truck mode or slightly set back (I prefer the latter). Additionally you can add the cannon and blaster (which are transformed pieces of the engine and drive shaft, a great idea!) to the tanks, too. I’d have loved to see this mode in battle against Shockwave. Robot Mode: At first glance nothing has changed here. Looking closer, though, reveals a few differences, the biggest and most obvious being Prime’s abdomen, where we now have a pretty impressive looking, screen-accurate sixpack instead of the engine grill. I really like that, I must say. Also Striker Optimus Prime is the first of his kind with visible eyes. They are sculpted differently and stand out a bit more, a nice little detail. Another, more significant improvement to the design can be found on the forearms. Sadly this is hidden by the panels of the hood and thus rendered useless. These panels have replaced the swords, by the way. Too bad, but not a big thing. Removing the sword has removed one of the figure’s biggest flaws, only to replace it with a new flaw: the missing swords. Sounds confusing? It’s meant to be, but this flaw can be fixed. More on that later. Transformation: The flaw of the highly complicated transformation of the hood has been fixed almost 100 percent. Thumbs up to the designers! Mechtech: Just like all figures of the DOTM mainline Optimus Prime, too, has Mechtech weapons and these are really special. 1. Optimus is the first Leader-class figure to have REAL Mechtech weapons. 2. Optimus comes with two weapons. The engine block becomes a blaster, the drive shaft a cannon... or maybe vice versa, but who cares? They look cool and are highly detailed. 4. The combined weapon is a Mechtech weapon, too, meaning it can transform into yet a bigger gun. Not part of the instructions, but I discovered it anyway, ha! 5. The Stealth Force hood enhancement becomes a shield, looking a little bit like the one Optimus Prime uses in Tchernobyl to fight Shockwave. 6. The Mechtech weapons can be put on the shield, so the whole thing looks less like a truck’s hood. 1. Battle Blades: No, but separate swords are available at Toys R’Us in a limited edition (10,000 pieces) for fifty bucks. 2. Jetfire combination: yes, but it’s pretty shaky. 3. Jetwing combination: In alternate mode, yes (and boy does that look cool!) 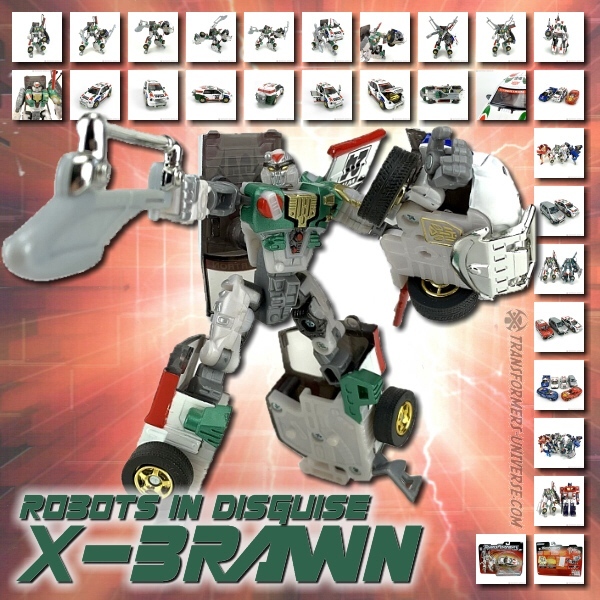 In robot mode: sadly, no. Conclusion: Those who own a previous version of this figure won’t consider this one a must-have, but I still recommend it. Using Philister’s school marks, I’d give an A-. If the blades were included, I’d raise it to an A and if the Jetpack would fit in robot mode, it’d be an A+. Add the Buster cannons for an A++ and the Buster paintjob for an A+++. Articulated fingers would have added a smiley. I’ll fix this last “flaw” myself.